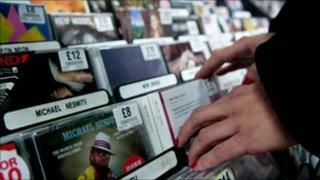 Music and books retailer HMV Group will close 60 UK stores in the next 12 months in response to declining sales. Christmas sales at the firm - which also owns Waterstone's bookshops - were down 10%, and it warned profits would be at the lower end of forecasts. HMV blamed the bad weather and "challenging trading conditions". The firm's shares dropped 20% after it revealed the sales data, and admitted it was having trouble meeting the terms of a bank loan. The continuing woes of HMV underline one major fact of life. Thanks to recession, technological change and wider social trends, the record shop as a mass-market phenomenon now belongs to a bygone age. HMV has been struggling to move away from that business model for some time, following a "transformation plan" that began in March 2007. But as it has diversified into other areas, it has started to lose its distinctiveness. In other countries, retailers with more focus are selling CDs either as "cultural products" or "technological products". HMV is in danger of forgetting why it wanted to sell CDs at all. What next for UK's last big music chain? The 60 stores set to close represent roughly 10% of the group's UK High Street presence, which comprises 285 HMV shops and 312 Waterstone's outlets. It is understood that 40 HMV branches will close along with 20 Waterstone's bookshops. As well as the store closures, HMV said it would implement other cost-cutting measures that would save it a further £10m per year. Like-for-like sales for the crucial five weeks to 1 January were down 10.2% on last year, due to a 13.6% slump at its HMV music stores in the UK and Irish Republic, according to the firm's trading statement - which was issued a week earlier than planned. HMV was not the only retailer blaming the cold weather. Clothes chain Next said it had lost £22m in store sales because shoppers stayed away when the snow fell in the run-up to Christmas. However, there was better news from the department store John Lewis, where like-for-like sales for the Christmas period were up 7.6%. Its supermarket division Waitrose also said it would open 39 new stores this year, creating 3,000 new jobs. "[HMV's] core music and DVD market is falling faster than expected," said retail analyst Nick Bubb of stockbrokers Arden Partners, despite attempts to change their sales mix, offering iPods and live music. He describes the snow impact as a "silly excuse" noting that the strong showing by John Lewis gives the lie to many retailers' claims that Christmas sales suffered because of poor weather conditions. Among the many challenges facing music retailers are the sluggish recovery in UK consumer spending, competition from supermarkets and online retailers, and the shift in technology away from DVDs and CDs towards downloads. Industry pressures have led to the failure in the past two years of High Street competitors such as Woolworths and Zavvi, and Mr Bubb describes HMV as "the last man standing". HMV conceded that the "entertainment market" was proving weaker than hoped, and pointed to "well-reported consumer headwinds as we enter 2011". "The pace of change in the markets in which we operate underlines the urgency with which we must continue to transform this business," said the firm's chief executive Simon Fox. The company said profits for the year to April would be at the bottom end of the £46m-60m range expected by markets. HMV's share price has declined steadily throughout 2010, and the latest drop brings its cumulative fall to more than 75% over the last 13 months. With the rise in VAT dampening consumer spending, and households' fear of interest rate rises a potential second dampener, 2011 is likely to be one of those Darwinian years, which sees the extinction of retailers genetically incapable of surviving a long economic winter. The firm also said that it was struggling to avoid breaching the terms of a bank loan. "The board now expects that compliance with the April covenant test under the group's bank facility will be tight and is taking further mitigating actions during the next four months to address this," the company said. The company did not elaborate on what covenant was involved, or whether a failure to meet the test would constitute a default on the loan. Having already halved its dividend after an earlier profits warning in December, Mr Bubb suspects HMV may axe it altogether in order to conserve cash and keep its creditors happy. He says another option would be to sell its bookstore, Waterstone's, which should raise enough to pay of the group's debts. Sales at Waterstone's appeared to have stabilised according to the trading update, and were unchanged during the Christmas period compared with a year ago. The company attributed this "pleasing" result to turnaround actions implemented last year. Separately, fellow retailer Games Workshop also saw its share price dive as it faces tough trading conditions in the entertainment market. Sales of its fantasy figurines and other products fell 4% in the six months to 28 November compared with a year earlier. The company further warned that "difficult trading conditions since that time mean that this shortfall is unlikely to be recovered by the year end". As a result, the firm feared that profits for the year to May were unlikely to meet market expectations. Shares in Games Workshop fell nearly 18% in early London trading.